Snapspheres - What do you do with a Snapsphere? It's a head turner. It's just the right size and ultra-unique that everyone will notice. It's a puzzle. Your memory is also a challenging 32 piece puzzle. The colors and quality are amazing. It's quite astonishing how well the globes look. They're easy to store. Since they're held together with magnets, they disassemble for easy storage. They're durable. They can take some rough-housing and make a wonderful shattering sound that will cause momentary panic. Fun! 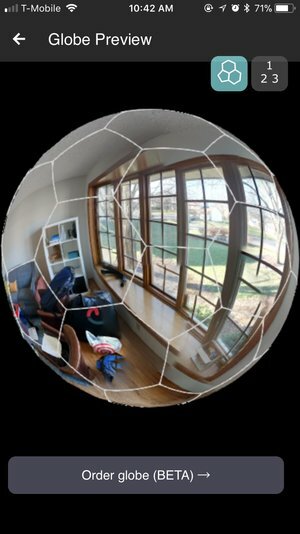 Take your own 360 photo image (from your phone or dedicated 360 camera), preview and upload it using our Globe Preview Tool for Android, iPhone, or Desktop (chrome required).